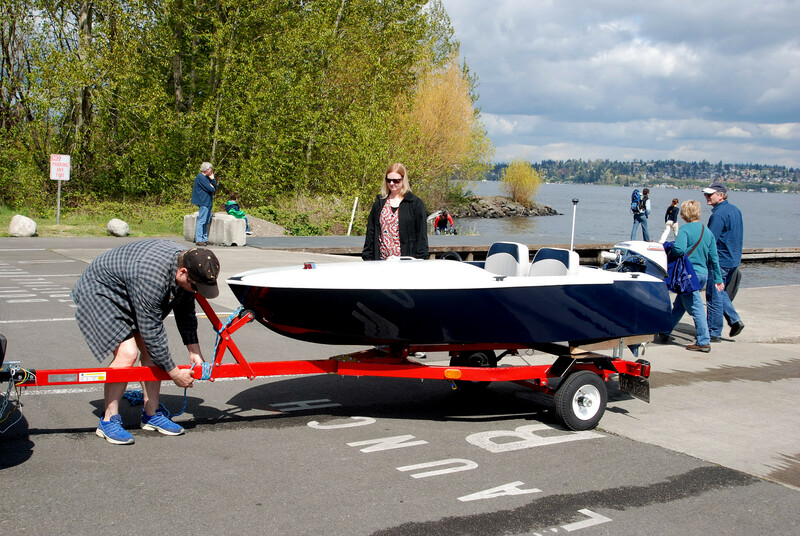 After a fabulous “sea trial” on Lake Washington, the new keel performed brilliantly. It kept Pleione running smooth and straight. It is still a little weird around docks. It is hard to turn at low speeds. 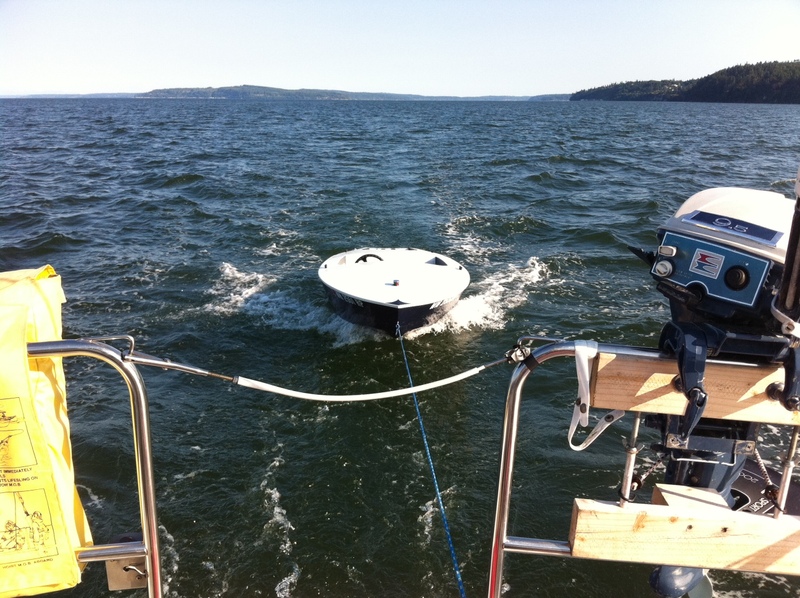 So, we took off for the San Juan Islands with Pleione neatly in tow. Keel over . . .
Pleione is now upside down again . . . Boy does that hull need some work . . . but that will have to wait for later. Right now, it is time to affix the newly crafted keel to her bottom. 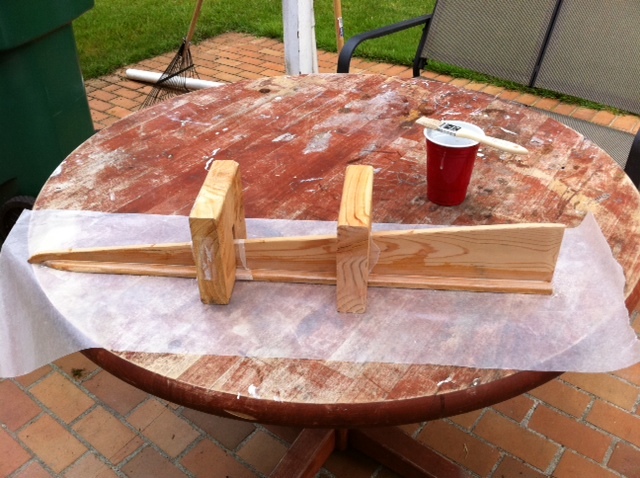 I put fiberglass and epoxy over the keel, sanded it down, and then had to figure out a way to find a good center line. 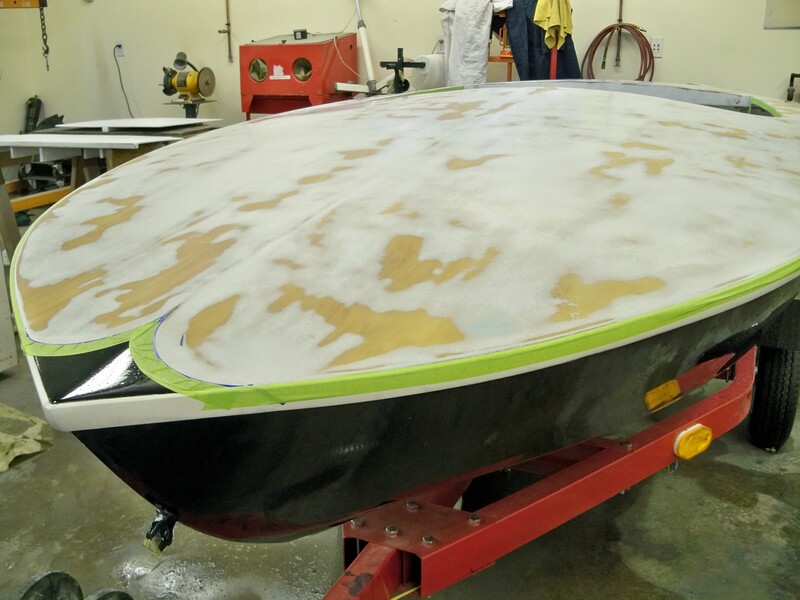 Lines are a little vague back there by the transom, as the hull gets flatter and flatter. Luckily, neighbor Dave happen by and helped me snap a chalk line. We took some more measurements, made a few adjustments, and found what I believe will be a good line. Next, how to get the flat bottom of the new keel to conform to the rounded nature of the hull bottom. After trying to sand a groove in the bottom of the keel plate, I decided to let nature help. 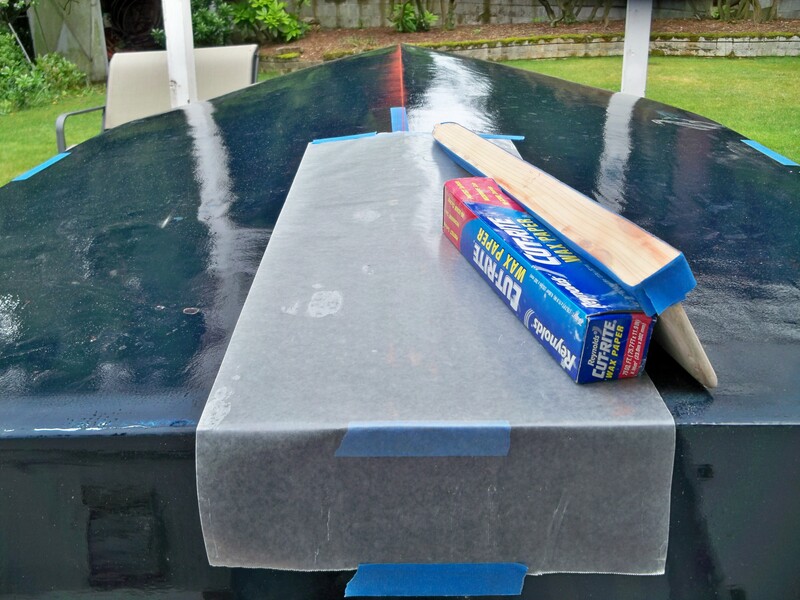 I gooped on a thick coat of epoxy, placed the keel in its final position, and weighted it down. 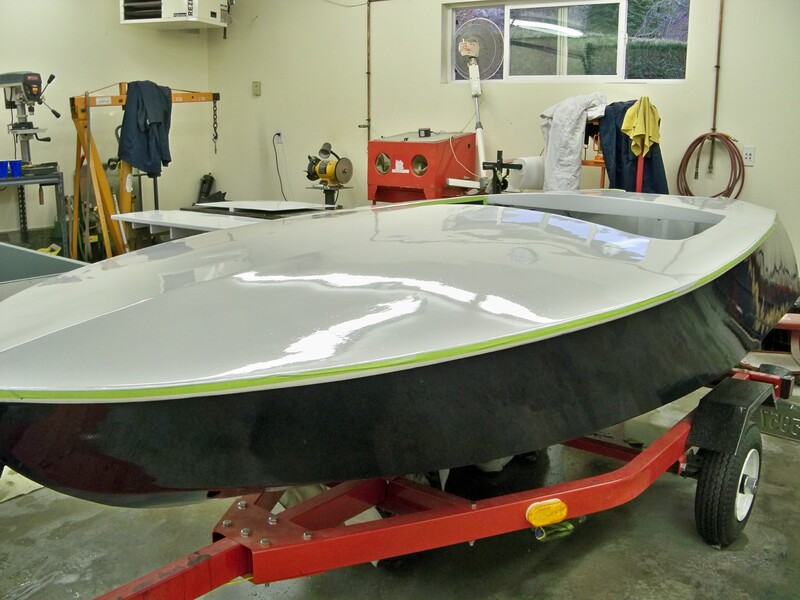 That way, the epoxy can flow to the low spots and form a shape similar to the bottom of the boat. 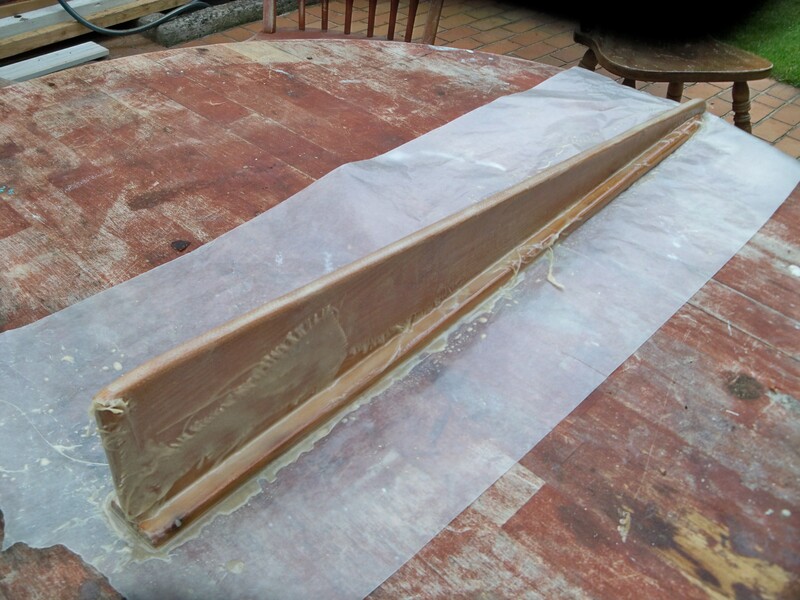 I put a sheet of wax paper down first, so I could separate the keel from the hull after it sets. What a goopy mess. Sigh . . . time to start sanding. All sanded . 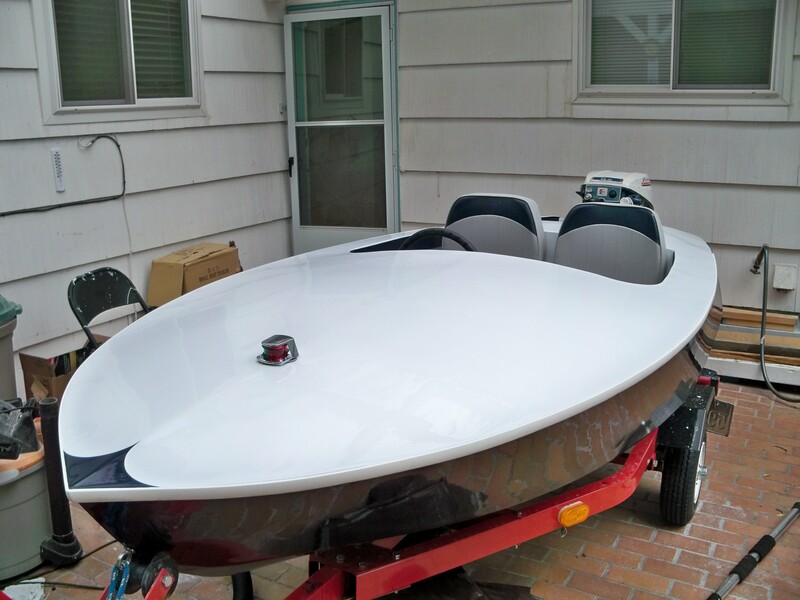 . . ready for epoxy on the bottom to fit to the hull. Weighed down for a snug fit. 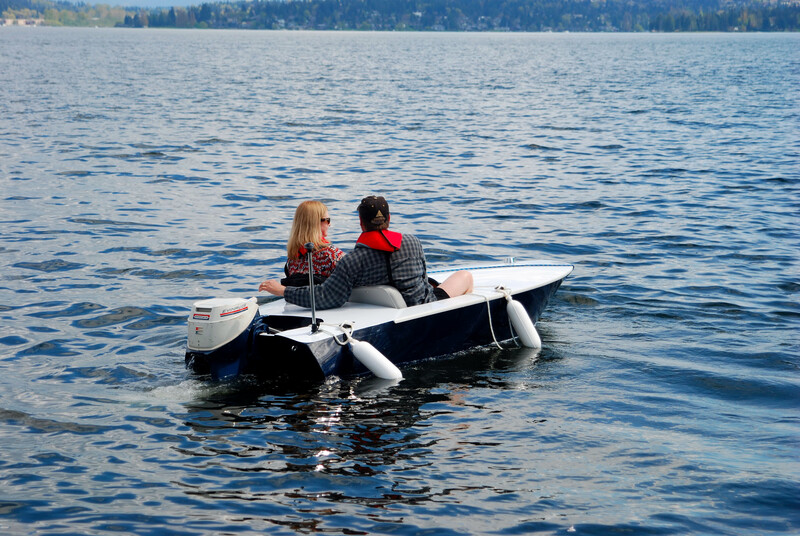 Pleione is a great little boat. It is tons of fun. 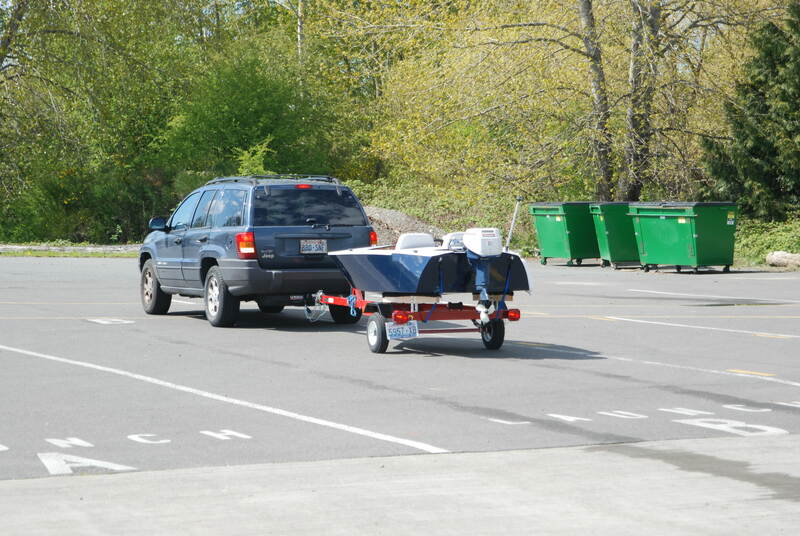 When we tow it behind our sailboat, and when we maneuver it around docks, the back end slides around, and it is hard to steer it straight. 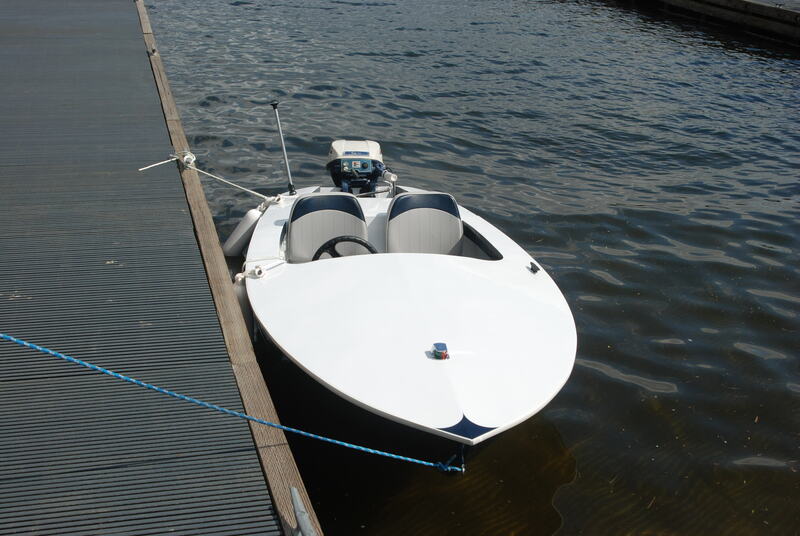 I should have installed the “optional” keel strip in the plans. 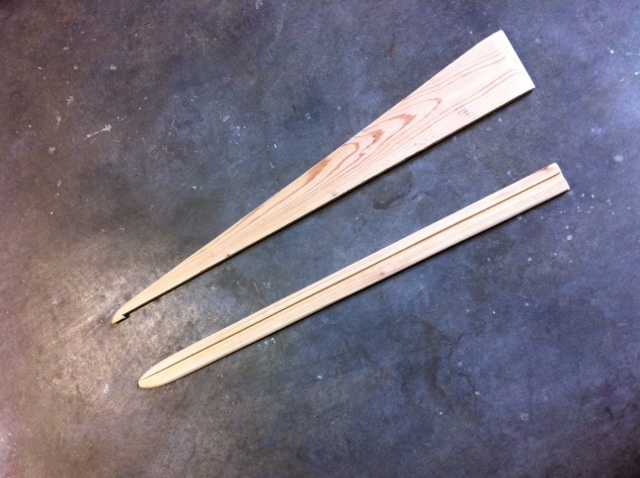 After talking to Carl and looking at other boats, I have decided to design and build a keel fin. Not because I have suddenly become a marine engineer, but because I think I can. 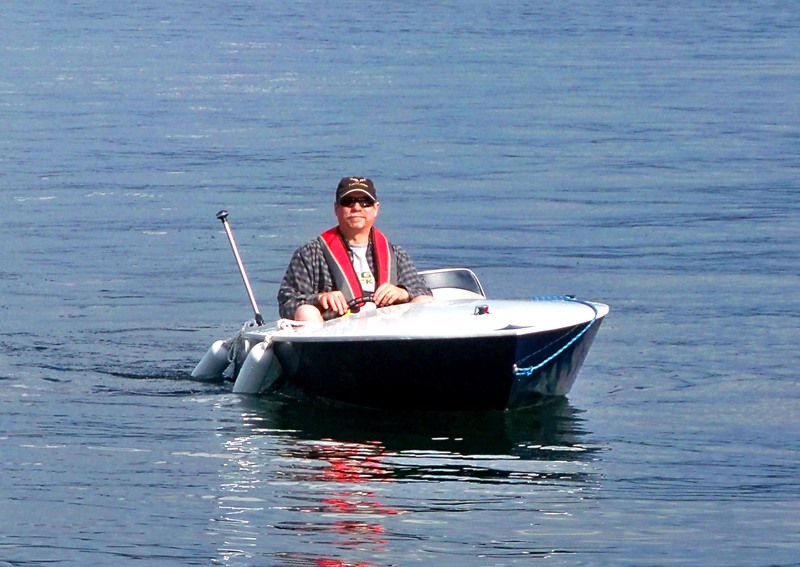 It is a piece that can probably tolerate a little variation, and still keep the boat tracking in a line. First I cut out and shaped the pieces. A fin, and a base. 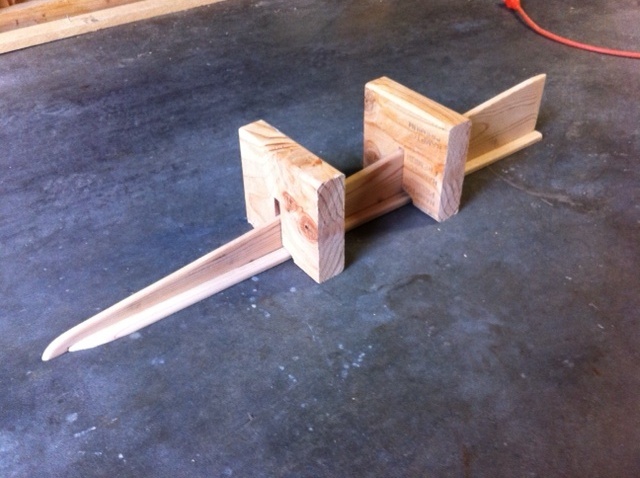 Then I had to figure out how to put them together and maintain a perfect perpendicular blade. I remembered how my guitar building friend, Stephen, makes jigs for everything. So, I designed a little jig. 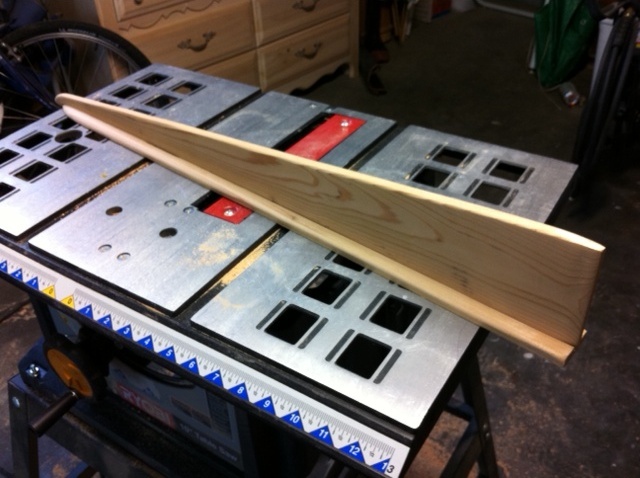 Two blocks made out of 2 x 6’s with slots cut in them to hold the blade “just so”. First, cut and shape the pieces. Next, test fit the pieces to form a keel fin. The jig blocks hold everything together. 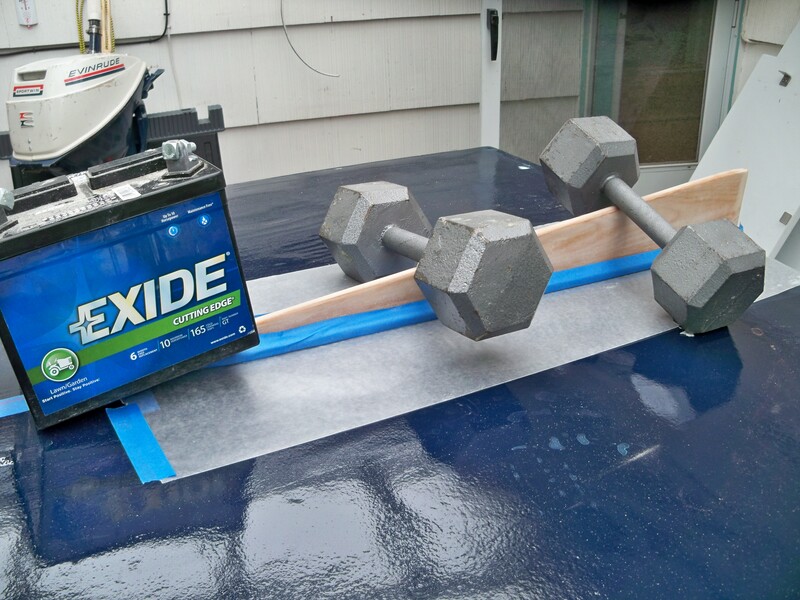 Slather on the epoxy, and make two pieces one! As promised, here are some pictures Tom took. 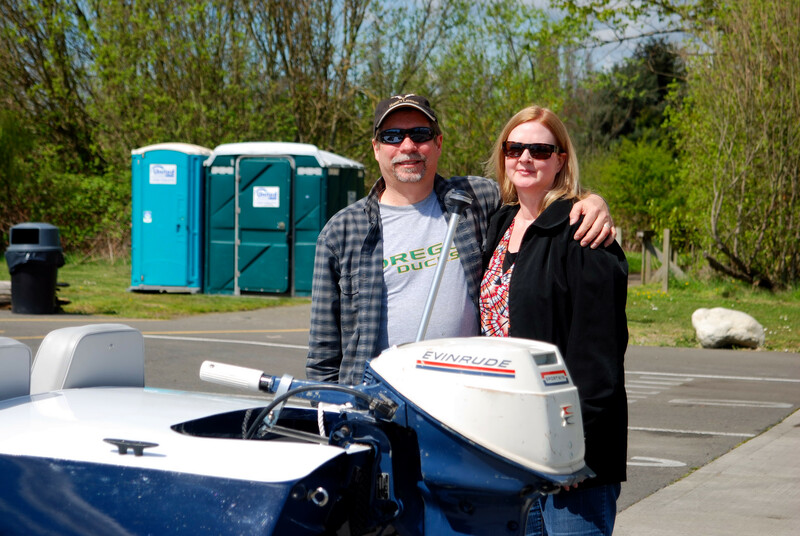 After these pictures were taken, Allison and I took a two hour boat ride around Lake Washington. Pleione was smooth and comfortable. When we got back to the dock, we each took the boat out by ourselves. It went much faster with one person than two. Almost too fast. It was a thrill ride. Thanks to all who have watched my progress, and commented along the way. Now . 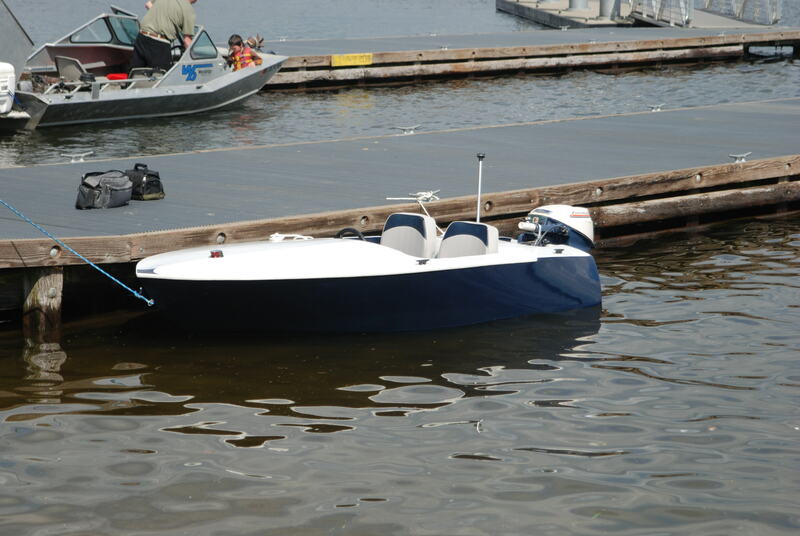 . . it is time for boating season! Happy couple going . . . bye bye! We test launched Pleione today. My friend Tom was there to take pictures. I don’t have his pictures yet, but when I get them I’ll post them. Everything worked great . . . even my cheesy steering system I invented. Low tech. Effective. 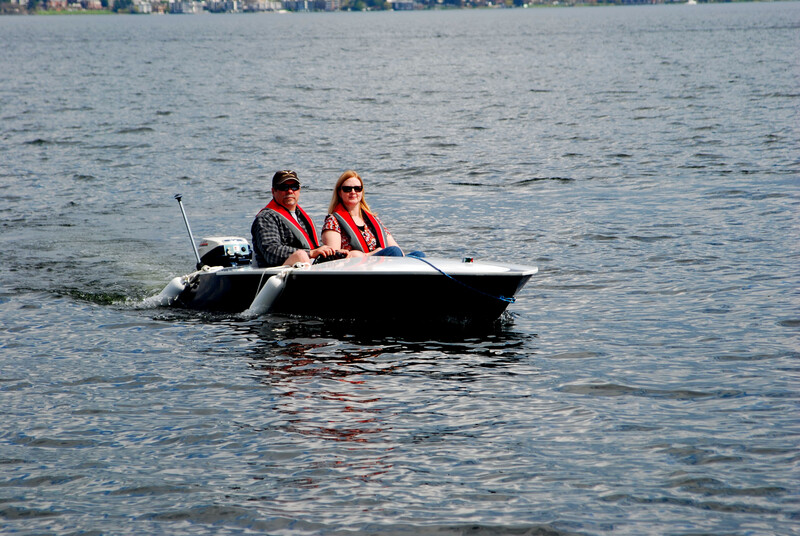 Allison and I spent two hours on Lake Washington. The boat didn’t go as fast as I thought it might when we were both aboard. Each of us took it out alone, and it went MUCH faster. 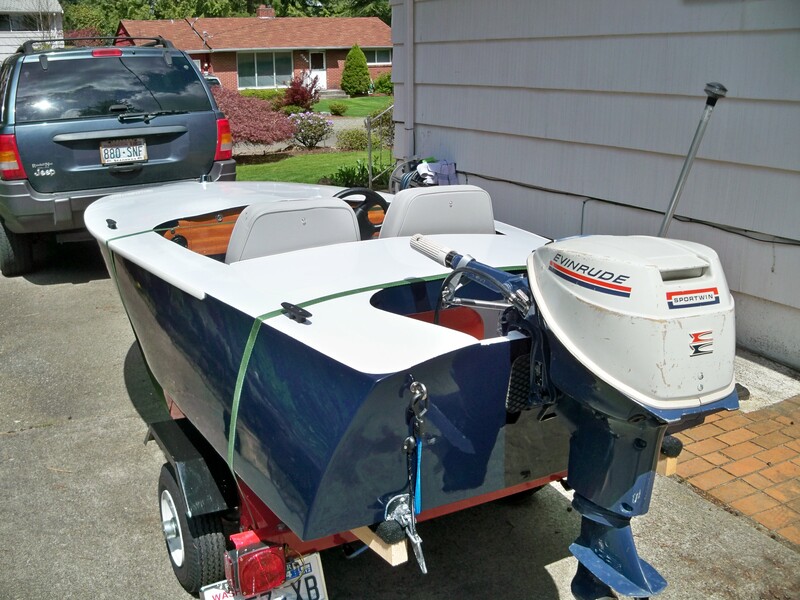 Now we are ready for the boating season. That's me . . . in my boat . . . in the water . . . woah! Pleione is back home now. Ready for final assembly. Yesterday I mounted the motor, and worked on the steering. I also attached the dashboard, and started planning the final seat installation. My original hinge idea won’t work, as there is no secure way to fasten the hinges to the plastic seat bottom. I have a new idea for L brackets, and will go in search of some stainless steel today. 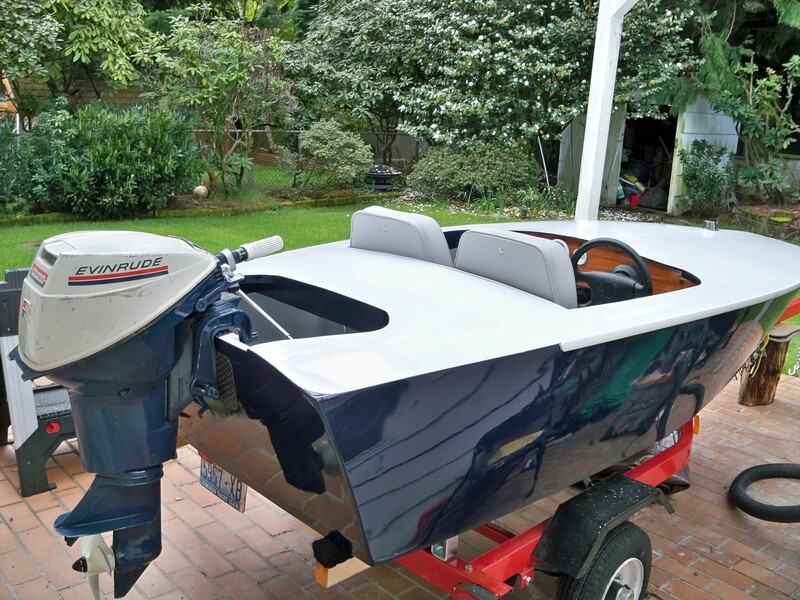 It's looking more and more like a finished boat. There are still a surprising number of decisions to be made. The hull is complete. Now, we move on to the top sides. First, I sprayed it with flat black lacquer primer, then sanded it off to get down to the smooth. Then I carefully applied the first coat after Kim cleaned up the garage to keep the dust down. It went very well, but we will still have to sand between coats tomorrow. Sanded smooth . . . ready to paint.